Built from the Bronx up. Built upon the energy and entrepreneurial spirit of New York City’s northernmost borough, Union Crossing has been developed as a mixed-use center of commercial activity that offers flexible office and studio spaces and retail amenities to the growing creative community of Port Morris. Union Crossing was originally built as a major baking facility for the Great Atlantic & Pacific Tea Company. Later, as A&P moved its production outside of the city, the building was purchased by the Union Standard Equipment Company and became the world’s largest warehouse and rebuilding facility for food processing and packaging equipment. Today, the Union Crossing building is undergoing extensive renovations to prepare for its next epoch as home to a legion of Bronx businesses. Union Crossing’s large, light-filled floor plates offer flexible space for offices, maker studios, commissaries, shops, and cafes. Several floors feature breathtaking water and skyline views and 20+ foot ceilings. Retail space is available with direct street access and lobby frontage. 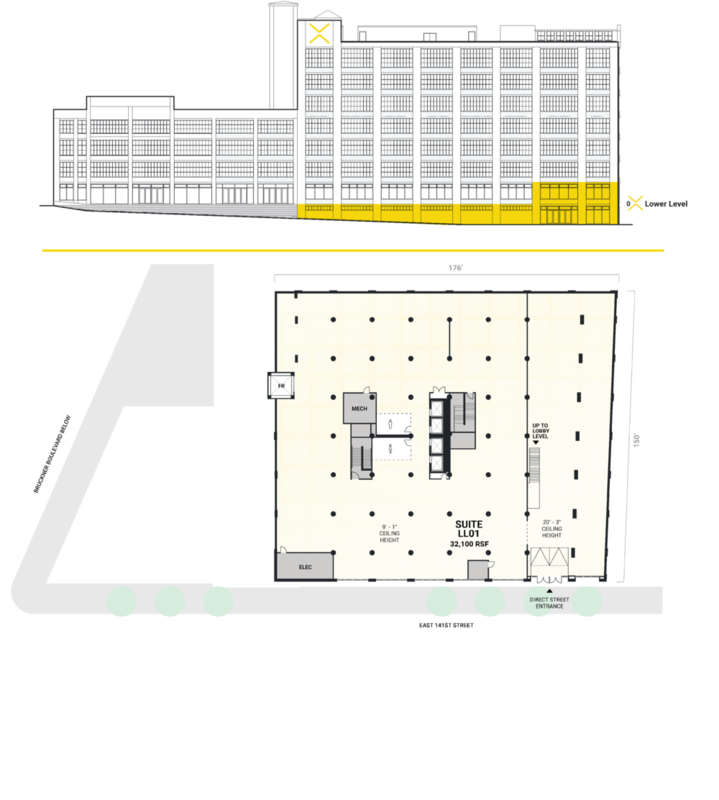 State-of-the-art infrastructure includes brand new MEP systems, passenger elevators, and windows, and the building features direct loading off of Bruckner Boulevard and oversized freight elevator access to every floor. Union Crossing’s loft-like physical character recalls its rich history as a production and warehousing facility that served the food industry for many decades. Space available for occupancy mid-2019. Pan around to take in the views from Union Crossing’s office floors. All lines lead to Union. 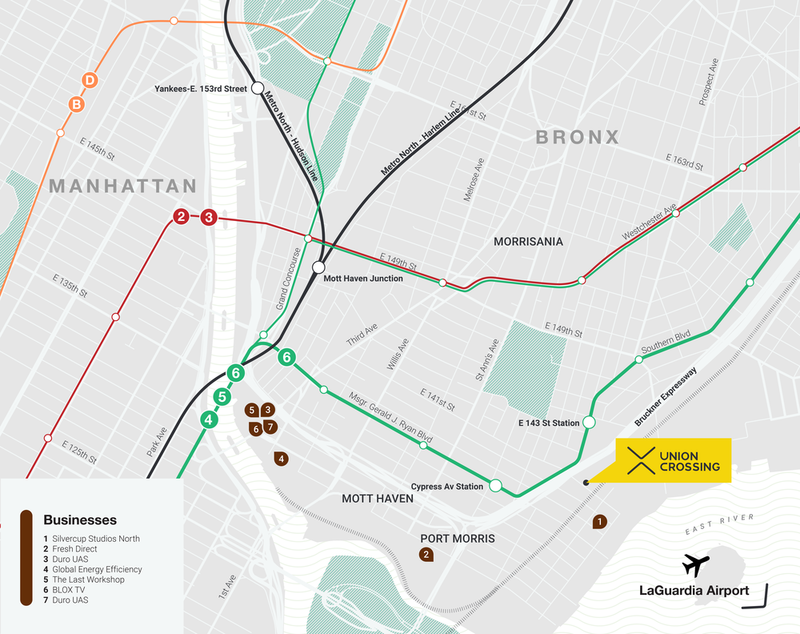 Union Crossing is conveniently located near the number 6 train and the Bruckner Expressway in the emerging Port Morris neighborhood. Access to connective rail lines drove the early development of the Port Morris waterfront around the turn of the 20th Century, and major transportation arteries continue to define the neighborhood today. The area is home to a growing list of businesses, artist studios, galleries, restaurants, and recreation spaces. Businesses who choose to locate at Union Crossing can take advantage of the plethora of financing and incentive opportunities available to promote commercial development and growth in the South Bronx. The Union Crossing development is led by a partnership consisting of Madison Realty Capital, The Altmark Group, The Bluestone Group, and Galil Management. The design team includes Woods Bagot as architect and branding consultant, AMA Consulting Engineers as MEP engineer, and McNamara Salvia as structural engineer. JRT Realty is the exclusive leasing agent for the building. Interested in leasing space at Union Crossing? Please send us a note via the inquiry form below and a member of our team will follow up within 48 hours.